Not every homeschooler is comfortable just winging it with small kids. If you need a plan, here are four free online resources to check out. After spending our entire first semester in a rigorous, but BORING, grammar program, we were all feeling a little burnt out from classifying sentences and writing expository paragraphs. Ugh. One of the benefits and blessings of homeschooling is the opportunity to meet the needs of each of our children. The opportunity to teach the whole child, according to his or her individual God-given gifts is a great responsibility. The rewards are equally as great. I put mine in little binders. This is the whole set minus Geography- it was in use at the time! 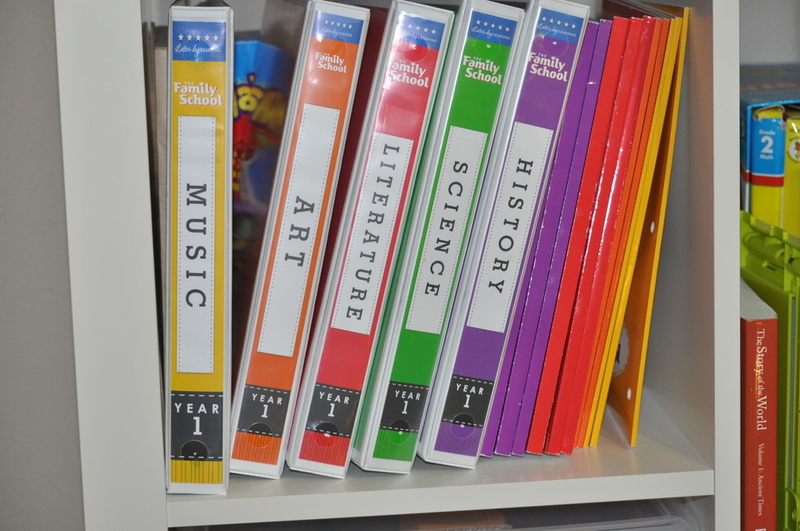 The colored notebooks to the right are the workbooks. They are color coded by subject for ease of use. First, a little background on my curriculum search. I got a degree in education and have always been interested in how kids learn, so I have studied and read widely on the subject. When I began looking into homeschool I was disappointed at the curriculum I was finding. Either it was fun, but academically anemic or it was academically rich, but didn’t employ the good teaching practices I had studied in college. I liked the idea of a religious curriculum but I didn’t want it sooo religious that ‘Nephi’ and ‘Abinadi’ were our spelling words, nor did I want to spend time altering mainstream Christian materials to mesh with my beliefs. Frustrated that I couldn’t find a curriculum that bridged what I knew about “education” and what I loved about “homeschool”, I began creating my own Hands-on, LDS-friendly, Classically-Infused, Nature-rich, Unit-studying, Standards-approved, One-Room-School-House, Homeschool curriculum for all Learning Styles. My dream curriculum was based on all of the favorite things I had found from each curriculum I studied. Needless to say, it was a LOT of work. And I didn’t get very far. Imagine my relief when one day I clicked on a link to The Family School and found they were doing exactly what I was trying to do, only they were doing it way better! I didn’t waste much time ordering and we happily started using it last August. I am convinced it is Heaven sent! I have started and stopped homeschooling so many times my kids should have whiplash from going back and forth, but this curriculum has given me the confidence that I can continue on with all my kids throughout their education. So What is The Family School? This curriculum covers, Music, Art, History, Literature, Geography, Science and Religion. It is being written as an outreach of the American Heritage School based in Utah. This school has teamed up with homeschool veterans to adapt their school curriculum to a homeschool setting. The scope and sequence involves a 6 year plan that you can repeat with your family. They are still writing the curriculum. I think the team is currently writing year three. Year One has been released. Year Two is in its beta year (they’ll take suggestions from test families on how to improve, then release for Fall 2014). And years three through six are yet to come. The bad thing about it being brand new and currently written is you can’t start on say, Year 4, as your first year because it doesn’t exist- yet. The creators could have waited to release all six years at once, but could see the need for this curriculum in their own homeschooling families. So in an effort to help ASAP they are tossing it out there fresh off the press. (And boy do I mean fresh. Last year our school started one week later than planned because of a delay at the printers.) The good thing about it being current is they are constantly taking feedback through their active user forum and improving the product to the meet the needs of the families using it. I’ve seen great improvements to an already great product just this year. They recently released an ipad format for Year 1 which looks really cool. What ages of children can use The Family School? I feel like the general scripted text is targeted at an upper elementary level. There are activity suggestions for younger children that have been suitable for my kindergartner and second grader and adaptable for my pre-K student. The activities for older children are often right on or a little heavy for my above grade fifth grader. The Advanced children’s assignments we haven’t ever touched, but look 14+ to me. I can with no preparation whatsoever teach the lessons at a 2-7 grade level. To make the lessons work for my pre-k and kindergartner I need to shorten, summarize, or skip a lot. We rarely cover everything in the lesson- they give so much in each lesson. I like that so I and pick and choose what is most relevant for my family. I graduated from high school, but I am learning from this curriculum. The way it is formatted the lessons are a springboard for learning with so many enrichment links to learn more and dig deeper. I think any age could benefit from this curriculum. The gospel principles are applicable to all ages as well. If I had a high schooler who wanted to participate in The Family School I would have them choose subjects to teach and let them be the teacher. The lesson format helps teach the teacher HOW to teach. For example: each lesson starts with an attention getting activity that engages the kids and gets them thinking. (This is usually my kids’ favorite part.) Then academic concepts are researched through plug and play scripts, informative online presentations and thought provoking questions. Then a gospel principle that relates to the concept is explored. Activity suggestions to apply and record what has been learned are then assigned according to skill level. Classic novels are recommended as family read-alouds that go along with what is being learned. Because the concepts are presented as first academic and then related to a gospel principle I don’t feel like the religion takes over the academic. The gospel principle sections in each lesson are substantial and sometimes heavier than my little ones need, but they have been inspiring to me and I feel like my testimony is growing by just reading the lessons. The gospel principles give me a natural opportunity to bear testimony often to my kids. The gospel principles are beautifully taught and solidly based. I definitely don’t think the religion takes away from the academics but adds to it and gives it relevance. But is it Academic Enough? One reviewer said they didn’t purchase because it looked weak in the academics. I don’t know how to measure how “academic” something is, but I know The Family School is a heckuva lot deeper than any public school I went to. And I am learning loads. I almost had a heart attack when I read over the first unit in science classifying invertebrates that I had never heard of. Or when I saw The Comedy of Errors by Shakespeare on the Literature list. I knew nothing before about echinoderms or The Bard, but now I (and my 3-10 year olds) can geek out with the best of ‘em on both subjects. With all the further reading, recommended links, and enrichment activities the sky is the limit with the academics and it would be simple to beef up for super-schoolers. What about Math and Language Arts? Not included. Bummer. Maybe someday they will simplify that for us all as well. What do I like best about it? I am learning WITH my kids. The lessons are fun. The gospel connections provide a framework for all the things we learn and tie it all together. I have felt the spirit more times in one semester of Family School than every family home evening we ever had combined. I can spend zero time preparing and still have successful lessons. (If I read through the night before things are even better!) I am learning better teaching skills using their methods. The six year outline gives me confidence that there won’t be huge holes in my child’s education. My favorite feature is the Online Library they give access to when you order the curriculum. In the online library each lesson has awesome online links, power points, movie links, enrichment links, worksheet printables and more in addition to the purchased printed materials in the manuals. Would I do anything differently next year? Instead of trying to cover a different subject each day of the week I will do one whole unit of a subject (one or two weeks) before rotating to the next subject. I will outsource one subject to my oldest to help teach. I will not purchase the workbooks- I will just print as needed. I will make one notebook as a family to hold all of our work for the year, instead of buying separate binders for each kid. I will co-op the art and music lessons with a friend so I don’t let those subjects fall by the wayside. I will not try to cover everything in every lesson. The Family School provides an excellent model for home education. I would recommend it to homeschool veterans and beginners alike. Knowing all families will teach and learn differently, it is loosely structured enough to provide wiggle room for varied ages, teaching styles, educational philosophies and school structures. Though no curriculum fits all, this is as close as I’ve seen to a one-size fits most program for LDS homeschoolers. The Latter Day Learning Conference is in May. I am too far away to attend, but if you are a Utah local you can get a hands-on look in a few weeks and see what these people are all about. Last year they offered about a $50 discount to the curriculum during the conference so if you are thinking of ordering, do it during their conference dates (online too) rather than waiting until Summer. While the dollar sign might give you a heart attack, trust me, there is no way I could have purchased a boxed curriculum for all of those subjects and all of the ages of my children for that cheap, especially since I will be cycling back to Year 1 with my younger kids in five years. This has been worth every penny for my family. Have you used The Family School, or do you have questions about this new curriculum? Comment below. Spring has sprung and all is beautiful, new and right with the world- until I realize Summer is coming and I will need a bathing suit. Ugh! I have never been petite. Even when I was born I was bigger than most and I am okay with that. No matter how secure I am with my big bones in Fall, come Spring I lose all confidence when I am blinded by my winter-white skin in the dressing room mirror and find myself drowning in rejected suits on the floor. As my body has inflated and deflated like an inner tube for the last decade I have had many opportunities to go back to the dreaded dressing room and I have learned a lot about what makes the perfect suit. Surprisingly enough, these same rules apply to finding the right homeschool curriculum. This spring as you are shopping for next year’s teaching materials (or this season’s suit) here are few things to keep in mind. I had a friend generously offer to lend me a suit when I found myself without on vacation. While I appreciated her kindness, she was a good 6” shorter and 80 lbs lighter than I. I looked sort of like a WWF wrestler (minus the muscles) in her tiny suit (yikes!) and went for shirt and shorts instead. Similarly I have had some excellent homeschool friends let me borrow curriculum that has worked well for their families. When I struggled to make this “tried and true” curriculum work for my family I thought there was something wrong with me. “I guess I am just not good at homeschooling.” The truth is, it was just not the right “fit” for me. Finding the right fit requires knowing a little bit about yourself. In swimsuits its body shape: flat chest, big chest, big bottom, no bottom, pear, sausage, etc. With curriculum it is educational philosophy. Are you strict, highly disciplined, relaxed, modern, classical, or hands on? There are names for all these philosophies in the home school world with support groups, materials, and help for each kind. Just like every body shape is different and beautiful in its own way, everyone is unique in their teaching approach and that is for the best. If you aren’t sure yet what your philosophy is try taking our quiz to get you headed in the right direction. So you’ve narrowed down your options to what types fit you best, but now you will have to start trying them on. I found a cute suit that I wore one year on an anniversary get away, but when I wore it later to the neighborhood pool with toddlers tugging at my straps I realized in a hurry this suit wasn’t for every pool. Different situations may call for different materials. Its good to have a variety at your disposal. Things that don’t work out right now for this kid may come in handy later for a different child, or may be something you can recommend to a friend that will be just what they need. Remember the song about the girl in the “Yellow Polka-Dot Bikini” who was afraid to come out of the locker? Trying something new can make us insecure, nervous, even terrified. I know I have felt all of these ways about homeschooling. Being afraid to fail, or of what others think of our decisions is not a good excuse for not trying. Homeschool requires trial and error. The error part scares parents. “If I try to teach and it doesn’t work I am a homeschool failure, wasted precious funds, and ruined my children.” Not true. This is part of the growth process and inspires others to try too. I have yet to hear of someone who has been sorry for any time spent homeschooling. If you spend much time comparing your beach body to the girl in the magazine you will get discouraged. But magazines are rarely reality. I discovered this at our local Texas water park where anything goes and all shapes and sizes bare all. Magazines use photoshop. Homeschool bloggers put their best foot forward. If you were to come to my house you would see homeschool reality and it wouldn’t be pretty. Don’t expect perfection from yourself, your kids, your spouse, or especially your house! No matter what curriculum you use leave room for human error. As a teenager I learned what is attractive to the rest of the world may not be the best thing for us. At public pools you’ll see a lot of belly buttons and people following fads that are driven by monetary gain- not society’s best interest. Public schools unfortunately are often driven by the almighty dollar as well rather than what is actually best for students and teachers. Could it be that sitting at desks all day, high stress, frequent testing, government mandated curriculum, and decreased family influence yields as much lasting happiness as a string bikini? Seek the words of the prophets and personal revelation in determining what is best for your family in today’s world of fashion AND education. I don’t remember what suit I wore to California with my family ten years ago. But I do remember what an awesome time we had laughing on the beach. No matter what suit you pick it’s not actually what you are wearing that matters. It is the memories and relationships you are making that will last. The same with curriculum. In the end it isn't going to be which publisher you purchased textbooks from that your kids will remember. It will be the time spent with you, the memories you made together, and the things you learned as a family that will stay with them. Last year I discovered this magical swimming suit that fits my body type, disguises some areas, is modest, is fashionable, and doesn't fall off when I am swimming with children. Hooray for Eddie Bauer’s Miracle Suit! I have also found a curriculum (after ten years) that is perfect for my teaching style, my kids’ varied ages and learning styles, is academically strong and religiously sound. Hooray for Latter Day Learning’s Family School and Life of Fred Math! Of course these may not be the “Miracle Suit” for your family. Finding just the thing for us has taken a long time. I am glad for the other materials I used in the past. I threaten the kids we will go back to it if they give me attitude about the good curriculum. ;) Sometimes it takes knowing the bitter to appreciate the sweet. 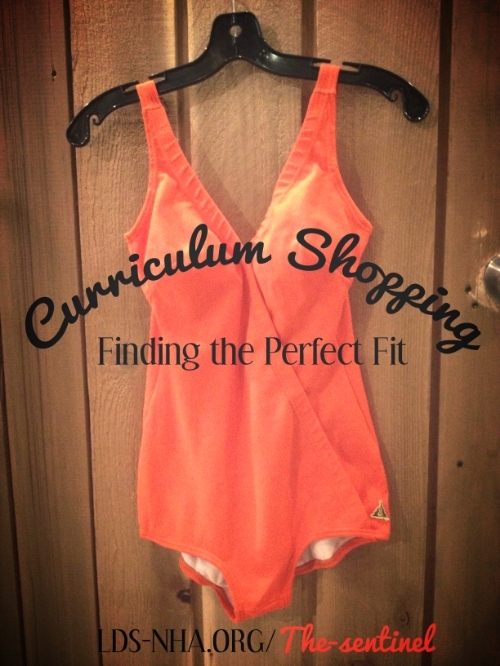 Check out our Curriculum Corner for some ideas on where to start your curriculum hunt.